I’m sorry, you’re called what? The Demon? The demon of what, you might also ask? It’s the torpedo of drag racers, born out an addiction to speed in a straight line, and its singular mission is to obliterate the competition on any drag strip. 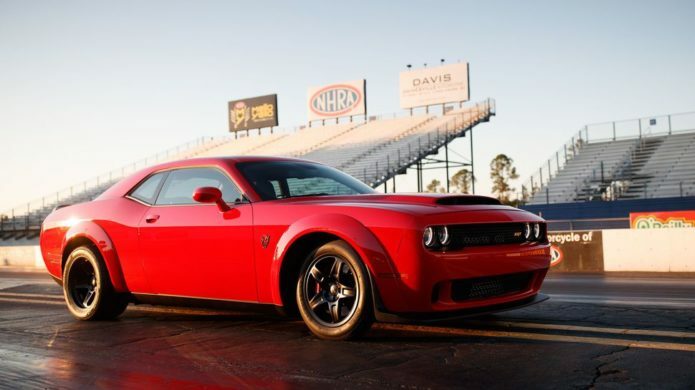 The specs say that the 840 HP V8 can propel this particular 4,275-pound missile from 0-60 mph in 2.3 seconds, and hammer out the quarter mile in 9.65 seconds at 140 mph. This is the world’s fastest production car, and it’s wearing an American badge. Experiencing the Demon’s raw power first hand left me in awe, but after seeing my colleague’s results for one of his best runs of the day – 0-60 mph in a spec-matching 2.3 seconds – I was just short of losing my mind. Actually hitting the on-paper numbers demand ideal conditions, of course, including yanking out the front and rear passenger seats for weight savings, and a proper launch. Dodge will take care of the seats for you, or alternatively sell you space for the kids in the back for $1 should you really want them.